It is said, "March comes in like a lion and goes out like a lamb." Many people reference this saying when discussing the weather. And historically, some of our biggest snow accumulations and stormiest weather have pounced the Capitol campus in early March only to be nuzzled out by warm sunshine and rising temperatures as April approaches. But the origin of this saying could be based on the nighttime constellations of Leo the Lion and Aries the Ram (or lamb). Look at the night sky in early March – just above the western horizon – the dim stars make up Aries. Now turn east and the constellation of Leo is found just above the horizon. In early March, Leo the Lion is rising in the east or coming in like a lion. By the end of the month, Aries will be on the western horizon, preparing to set or going out like a lamb. 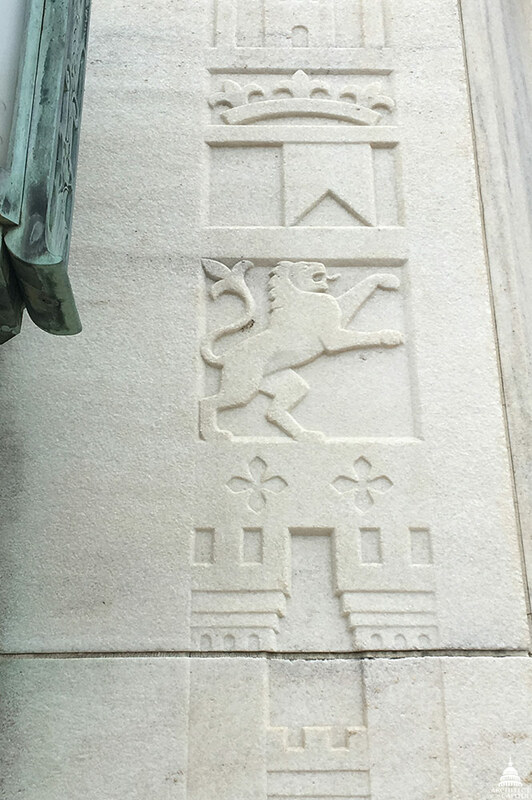 While architectural details on Capitol Hill do not pay homage to this adage, imagery of the lion is well-represented. Historically, lions were used in architectural ornamentation to provide a sense of strength, majesty and awe, especially on public buildings. 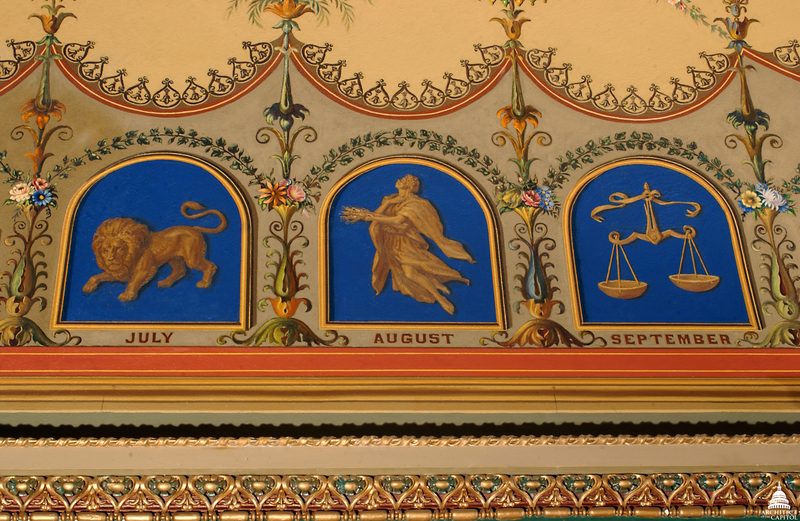 July's Leo the Lion represented in Brumidi's Zodiac Corridor of the U.S. Capitol. Leo the Lion is found in many places across campus. Leo represents the month of July in the Brumidi Corridors, stands on the word summer in the lobby of the Longworth House Office Building and is accompanied by a zodiac sign in a Dirksen Senate Office Building committee room. The Library of Congress buildings feature multiple lions – or their mythological counterparts, griffins – in paintings and sculpture. This art pays homage to ancient mythology symbolizing a mastery of both earth and sky and is associated with strength and wisdom. Lion Gate of Mycenae details at the Adams Building. In ancient Greek and Roman architecture, there are lions at entrances of cities, buildings and sacred sites. One of the oldest surviving sculptures dating to the 13th century is Lion Gate of Mycenae in Greece. At the entrance to its citadel were two lionesses flanking a column. 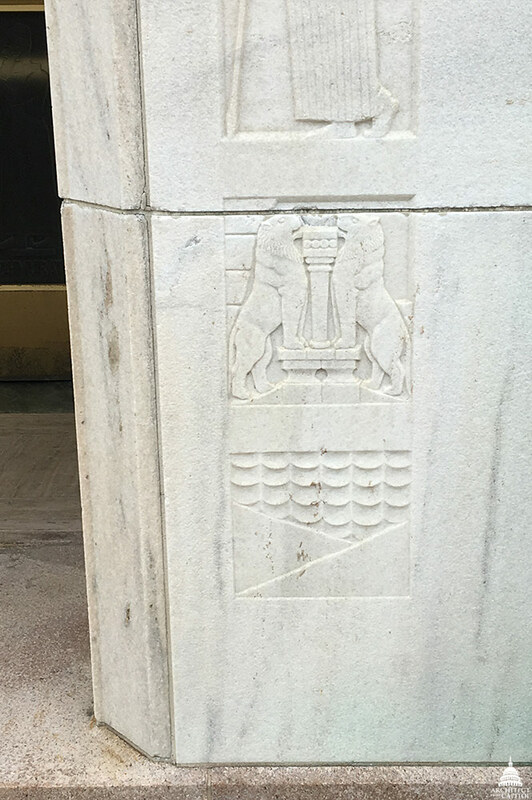 Similarly, the marble surround of the entrance portals of the John Adams Building features a 1930s sculpture of the Lion Gate of Mycenae and nearby is a reference in lion iconography of medieval Europe. 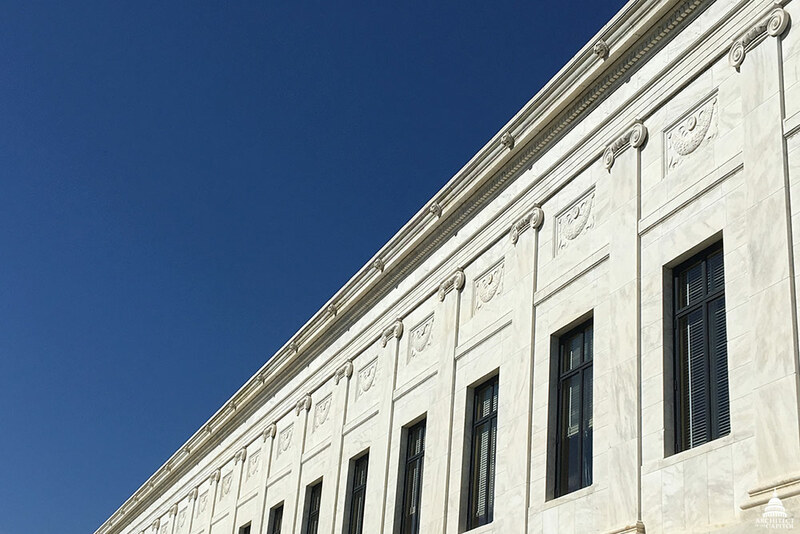 Stone carved lions on the marble facade of Supreme Court Building (can be seen close up in the story cover photo above). One of the most majestic buildings managed by the Architect of the Capitol (AOC) is the Supreme Court. Stone carved lions abound on the marble facades of the Supreme Court's in the land. Much like the gargoyles carved into European Gothic churches, the Court's lions are both functional and decorative. 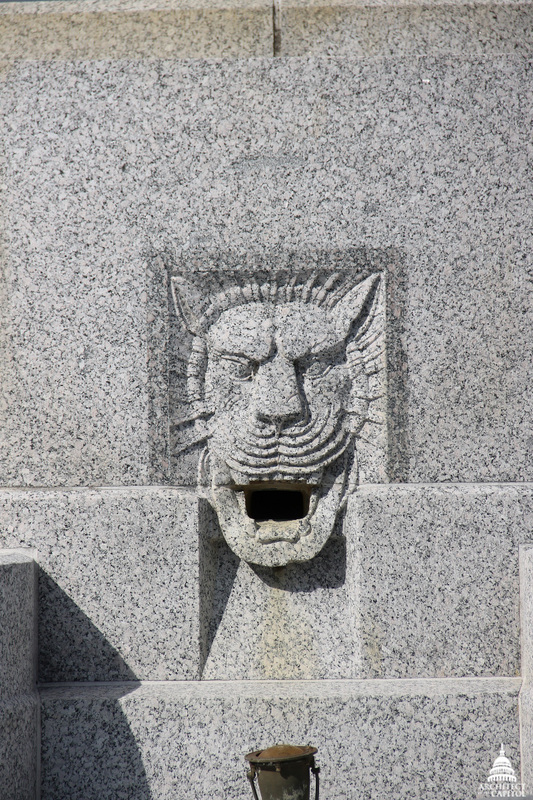 The lions serve as waterspouts projecting from the building's cornice which covers the rain gutters. Lion details at the Senate Fountain and Rayburn Building. 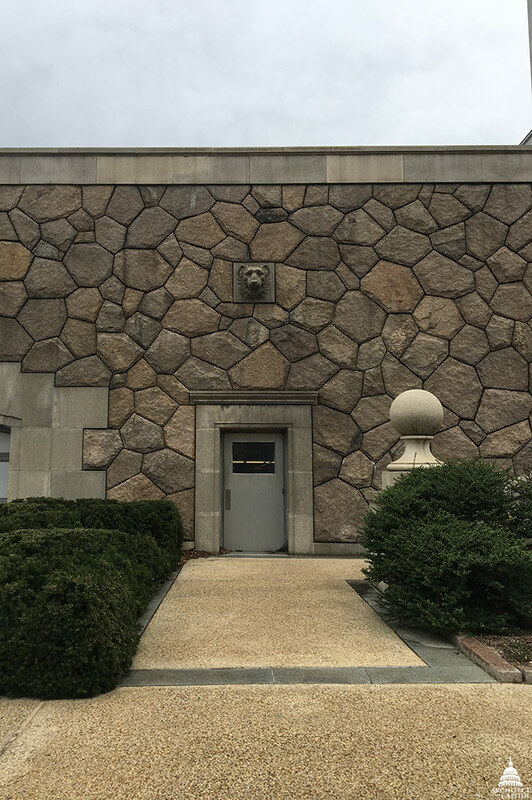 Lions are found at upper terrace fountain above the Senate Underground Garage along the vista terminating North Capitol Street at the U.S. Capitol, and a pair of lions flank the First Street garage entrance at Rayburn House Office Building as well. Taken as a whole, the lions on the Capitol campus are clear symbols of strength and majesty, continuing a millennium of architectural traditions. And like their predecessors from around the world, the lions now in the care of the AOC will tell future generations about our civic values… just not the weather forecast. Again thank you for our history lesson on the capital, never could find this a book. Thanks, Marty for an intriguing article on the capitol lions! I’d like to add a clarification on the Lion Gate of Mycenae date: it’s 13th Century BC...keep up the good work.